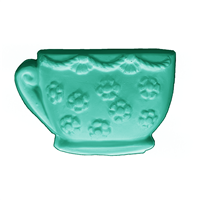 This adorable Tea Cup Soap mold resembles a classic english tea cup. The tea cup shaped mold is adorned with flowers and an elegant trim, and is complete with a swirled handle. Great for little girl's birthday parties, tea parties and more! Bar Length: 2.125" Bar Width: 3.125"